Professor Bodil Bluhm has found the perfect location for Arctic research. A dynamic academic environment, beautiful natural surroundings and excellent social benefits brought the German researcher to Tromsø in the northern reaches. 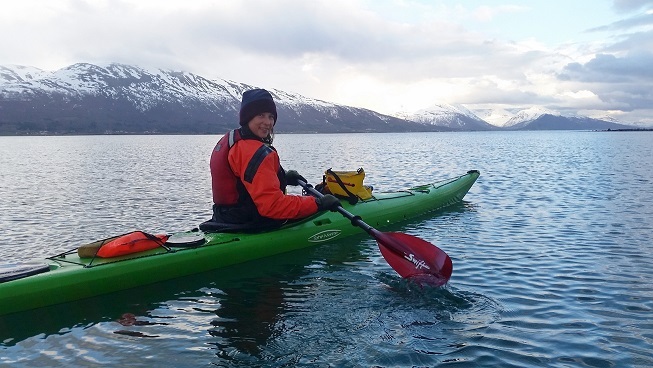 For Bodil Bluhm, Tromsø is a good place to work and to enjoy outdoor activities. Photo: Private. Bodil Bluhm (46) was educated in Germany and has worked in a number of countries. She spent 14 years in Fairbanks, Alaska before accepting a professorship in 2014 at UiT The Arctic University of Norway. In other words, she is used to living near the Arctic and had long had Tromsø in mind as a potential place to move. I work with Arctic marine system ecology, where Norway is obviously one of the leading countries. The university here in Tromsø has a top group in that field. I have had collaborations with some of their scientists before, so when they had a position it was too good an opportunity to pass up, says Professor Bluhm. Tromsø has a large cluster of excellent non-university institutions conducting research on marine life in the Arctic as well, including the Institute of Marine Research and the Norwegian Polar Institute. Dr Bluhm’s husband, who is also an Arctic researcher, was able to get a job at the Institute of Marine Research when their family moved to Tromsø in 2014. Their two children have begun kindergarten and primary school. Anyone relocating from one country to another has to complete a round of formal paperwork. Living in three countries, Germany, the US, and Norway, means there are a lot of things to organise, from taxes to registering our children who have dual citizenship. That has taken a lot of time and effort. But people in various places such as the tax office have been incredibly helpful, she says. Tromsø is home to many foreign researchers, and Dr Bluhm has sought advice from others on how to move ahead. She finds the people around the university to be very open and accustomed to being part of an international community. The natural surroundings and opportunities for outdoor activities were key factors of Dr Bluhm’s interest in Tromsø. In addition, there is a lot of open space there. Norway has a very strong social system in terms of support for health care, vacation time, and other benefits like parental leave for both parents. The situation is decent in Germany, but not particularly well developed in the US. Norway has a very high standard of living compared to many other places, she says. Life in Tromsø has also presented a number of surprising experiences. During the winter humpback whales and orcas came into the fjords here right around our island, about fifteen minutes from our house. Whale watching is a fabulous activity to do. Even in the dark you still can see them, Dr Bluhm says. The children have adapted well to the island community outside Tromsø where the family currently lives. It is taking a bit longer for the adults to become equally integrated because they work so much. But they are taking a Norwegian language course organised for international researchers and students by the university. The children are attending a Norwegian school and kindergarten. Their oldest daughter first attended an introductory Norwegian class for foreign pupils before transferring into a normal school after eight months. The youngest started in kindergarten. Both were able to speak Norwegian reasonably well after four months. Dr Bluhm appreciates that the Norwegian school system emphasises the social aspects of education and that the pupils are more group-oriented than focused on themselves as individuals. Researchers always find it a challenge to combine intensive research and family life. Bodil Bluhm believes Norway makes it easier to do this than other places. It is more balanced than in many other countries. It is OK to go home at 16:00 to pick up your child from school or kindergarten. That is more difficult in Germany or the US. But then you use a lot of evenings and weekends to get done what you need to get done. I work in a very active group, she says. It is also rare for meetings to be scheduled after 16:00 in the afternoon or over the weekend. This was new to Dr Bluhm. The atmosphere here is that it is possible and desirable to achieve a good work and life balance, at least in theory, she says with a smile, knowing full well that researchers always end up working more than a normal workday. The university’s Department of Arctic and Marine Biology has a group studying Arctic marine system ecology. It is world-renowned for its findings and has a wide range of international contacts in Canada, Russia and Alaska among others. Although Dr Bluhm is in Tromsø, she is still in touch with her previous colleagues in Alaska. Arctic research is an international field. It is interesting to see the list of Ph.D.students and applications for post-doctoral positions here. There is a very international pool of applicants, so obviously this is an attractive place for Ph.D. students and post-docs from a lot of different countries, Dr Bluhm concludes. Norway, and especially Tromsø, is an excellent country to live and work in for those who enjoy outdoor activities among beautiful, open natural surroundings. It is important to learn Norwegian – not because people can’t speak English, but language skills are a must for successful social integration. Ask a lot of questions. This will make it easier to become integrated. But count on having to learn along the way. Participate in activities that help you to find out what’s going on and how things are done. Get to know people through leisure activities such as kayaking, exercising and group hikes. It is an excellent opportunity to become acquainted with Norwegians and to learn about life here.